Iron is indispensable for a healthy life. Iron (haeme) together with protein (globin) makes up the haemoglobin that carries oxygen to all the cells in our body. When you do not have enough iron, you feel tired and look pale. Iron is especially important for pregnant women, and we often find doctors prescribing iron supplements for them. Fortunately, iron can be topped up through our diet. There are lots of iron-rich foods including greens, grains and seeds. Ingredients like sesame, which are commonly used in Indian cooking, are rich sources of iron. However, to make the most of these, you need to use the right ingredients in the right combinations. For example, excess calcium in the meal can hinder iron uptake, while a good dose of Vitamin C can improve iron absorption. In this way, a smart, well-planned menu can help you get enough of this vital nutrient. When we think of healthy meals, most people tend to think only of breakfast and lunch, and totally ignore dinner. However, just as a healthy breakfast helps to energize you for the day’s activities, a good dinner must make up for the lack of necessary daily nutrients, including iron. 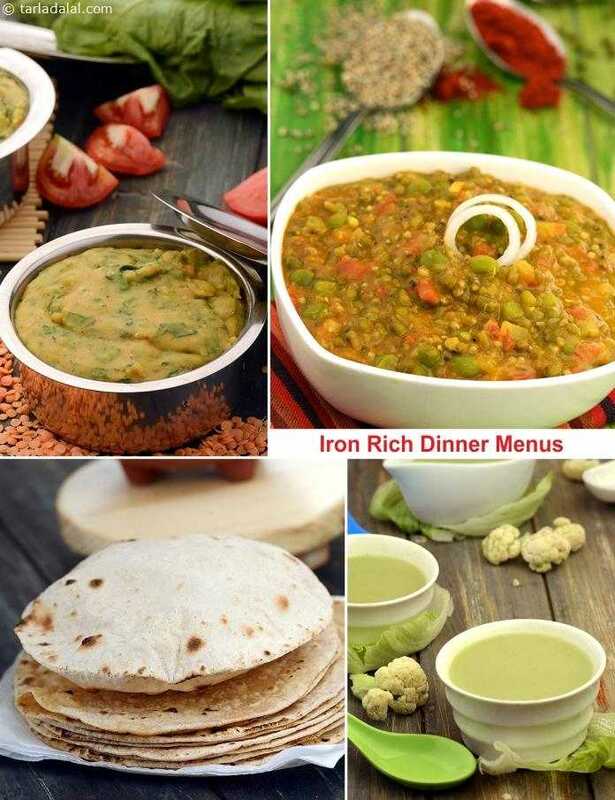 With this in mind, we have formulated interesting iron-rich dinner menus, which are sure to build your haemoglobin levels and keep you healthy and active. On Monday, let’s go for a wholesome subzi- Roti combo. Soft, enticingly-flavoured beetroot tikkis are bathed in an unusual spinach gravy, presenting you with an irresistible way to consume iron-rich spinach. Beetroot being a storehouse of Antioxidants helps iron in doing its activities, while the use of oats as a binding agent instead of potatoes or cornflour makes the recipe fibre-rich too. The Beetroot Tikkis in Spinach Gravy go well with hot and fluffy phulkas. Lettuce and Cauliflower Soup, which is usually just used in salads, comes together with cauliflower to make a mouth-watering soup, which is also loaded with nutrients. The vitamin C in cauliflower improves the absorption of iron in lettuce, making this an intelligent combo. This nutritious soup is served with another power-packed dish, the Bajra Whole Moong and Green Pea Khichdi, to make a satiating iron-rich dinner. A complete meal by itself, this khichdi is loaded with fibre, iron and Pregnancy Protein. Have a little time on hand today? Then, try this wholly satisfying combo. However, you need to plan a little in advance to prepare this slightly elaborate meal, so go for it only on a day when you have some time to spare. Ragi Roti, is a traditional Indian bread that is especially popular in Karnataka. Without a doubt, it is loaded with fibre and iron from ragi. This goes nicely with the Hariyali Dal, which combines protein rich dal with fenugreek and spinach, which are good sources of iron, Pregnancy Vitamin A and calcium. A snack like the Sprouts Dhokla adds more fun and nutrition to the meal. If you are pressed for time, you can skip it, but otherwise do give it a try! A one-dish meal for Thursday, chock-full of nutrients from healthy ingredients like whole wheat flour, sesame seeds and a host of veggies! The Spinach Tahini Wraps are not only nutritious but very tasty and exotic too, so everybody will love it. The whole wheat flour dough for making the wraps is enhanced with spinach puree. The colourful rotis are then lined with tongue-tickling pastes, and stuffed with a crunchy and juice filling of onions, tomatoes, and other ingredients. With so much nutrition and irresistible flavour, this dish has a very high feel-good factor too! Welcome the weekend with an exciting treat of Chawli Beans and Mint Burger, and Multiseed Mukhwas. Whole wheat buns are packed with an iron-rich chawli bean tikki that is enchantingly flavoured with mint leaves and bound together by fibre-rich oats. With nutritious and tangy green chutney and sliced veggies too, this healthy Chawli Beans and Mint Burger is a meal in its own right. For a bit of crunch, serve it with the Multiseed Mukhwas, which is loaded with Omega 3 fatty acids, iron and fibre. When health comes in such an awesomely tasty package, nobody can refuse it!